Rouge - Pink, leaning towards red. Like this for it's healthy glow. Touch of Pink - Looks orangey in the pot but it's just a milder version of Rouge. Gives a natural blush. Sandalwood - Light pink colour that isn't very noticeable on me. 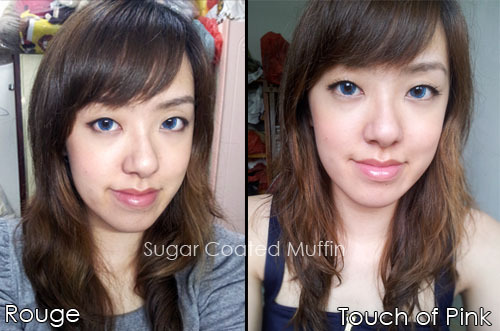 It's smooth, long lasting, natural looking and easy to blend. Pigmentation is not that great though. It's buildable up to a certain level. 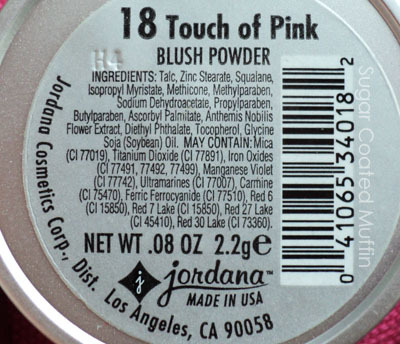 When applied to my face, Rouge & Touch of Pink look very similar. Suspect a few other shades will not show much difference as well so don't bother buying similar shades. I packed on the colour for the photos below since my camera really washes it out =/ There is no big difference between them on my cheeks =_=" Didn't even bother showing Sandalwood since you can't even see it in photos. My conclusion : My fav out of the bunch is Touch of Pink because it's natural but sometimes I add Rouge to the apples of my cheek. In contrast, Sandalwood has not seen much sunlight due to it being too light for me =/ Doubt I'll purchase any of the other shades as they all look kinda similar.